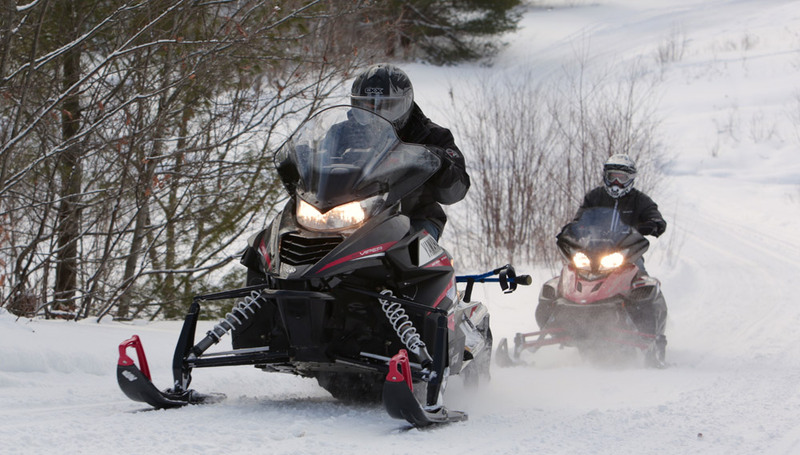 Ontario snowmobilers are blessed with an enormous network of snowmobile trails and an army of volunteers that make sure they are well maintained, signed and mapped. It’s a remarkably easy sport to participate in and enjoy – at least for most of us. For people with disabilities, however, snowmobiling may seem out of reach. While snowmobiling isn’t for everybody with a disability, I was hoping to show how the sport is more accessible than many might think – especially in Ontario, which has hotels, restaurants and gas stations reachable on a snowmobile. I asked my brother-in-law, Caleb Ray, to join me on a snowmobile ride to get his thoughts on the subject. Caleb has cerebral palsy – spastic diplegia in particular. As Caleb explains it, this means his lower body doesn’t work particularly well, but his upper body compensates; he uses crutches to get around. Caleb has experience riding ATVs, but as he only recently moved to Canada after growing up and in Texas and South Carolina, snowmobiling is completely new to him. We headed toGravenhurst, Ontario to change all that. We booked a beautiful two-bedroom suite at the Residence Inn Gravenhurst Muskoka Wharf, which overlooks Lake Muskoka. The suite was equipped with a full kitchen, fireplace and two bathrooms, but most importantly the property has direct access to the C101D connector trail. Throw in trailside gas and restaurants and Caleb would be able to ride his sled anywhere he needed to go. Yamaha Canada was nice enough to loan us enough sleds for me, Caleb and our videographer, Chris – a pair of SR Vipers and an RS Vector LE. We were able to park the trio of Yamahas right in front of the Residence Inn. After settling into the Residence Inn and taking care of the snowmobiles, the three of us drove up to Bracebridge to see a movie at the Norwood Theatre and grabbed some dinner back in Gravenhurst at Boston Pizza (also accessible on a snowmobile) before calling it a night. To give us some fuel for our ride the next morning, we took advantage of the breakfast buffet that was included with our stay at the Residence Inn. Not having to go out for breakfast gave us more time for riding. Read more about Snowmobiling With a Disability + Video at Snowmobile.com.